Whose Dhan is it anyway? Bankers sweat it out to connect with the poor and make Prime Minister Narendra Modi's financial inclusion scheme a hit. 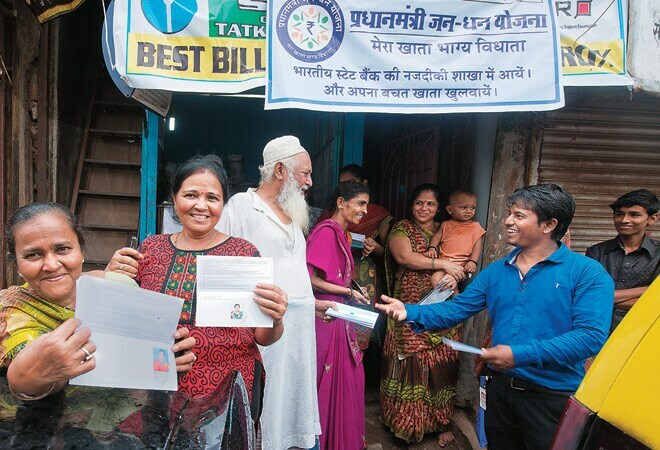 Manjula Magan Goswami, 50, a resident of Dharavi, one of Asias largest slums, has just opened a bank account for the first time in her life. Goswami, a cook, is still not sure why she needs an account and what the Pradhan Mantri Jan Dhan Yojana can do for her. "Everybody told me to open this account and I did it. It was not difficult. People tell me I can save money in this account," she says, not quite aware that the State Bank of India (SBI) account she has opened comes with benefits like an insurance cover and a debit card facility. Goswami is not alone in figuring out this newly thrust financial freedom on the poor. Since the launch of the scheme by Prime Minister Narendra Modi on August 28, SBI has opened more than 20 lakh accounts. Nationally, across banks, a total of more than two crore new accounts were opened within two days of the scheme's launch . Even before 2006 when the term financial inclusion started figuring in the lexicon of bankers, opening accounts for the financially excluded was not new to banks. But now financial inclusion has acquired a new urgency with the Modi touch. Bankers are not sparing any effort to open accounts. What also stands out this time is the design of the product that is being positioned as a win-win for all. However, at the moment, it is the banks that are really bearing the brunt of the cost of this scheme, if one ignores the government spending on advertisement to boost its image. Consider this: Most banks have to spend a minimum of Rs 100-150 per account - think of movement of documents, commission/fee paid to business correspondents at remote locations, cost of RuPay card, setting up of camps across the country. All of this to acquire a deposit of Rs 95, say in the case of an SBI account, which collected Rs 19 crore in deposits from the 20 lakh accounts it opened. The average deposit per account would be above Rs 400 if one goes by figures stated by finance ministry officials that more than Rs 1,000 crore was collected in deposits in 2.3 crore accounts even though bulk of these accounts would have zero deposits. The number of accounts opened within two days of the scheme's launch. That is not all. There is the annual maintenance cost. Typically, it works out to around Rs 100 per account a year and this is so even if the accounts are not in operation. So, in a sense, many banks start with a loss. More importantly, low-deposit savings accounts cost a lot more to service. Most banks in India require a minimum deposit of Rs 5,000 for a savings account. Some bankers in private concede that if this programme is to be viable then all direct transfers by the government would have to be routed through these accounts. What is more, there should be a minimum average balance of Rs 1,000 per account to enable banks to make a Rs 50 to Rs 60 profit per annum. This is again without any transactions happening in the account. If theoretically four operations, as is expected under this programme, are made at an ATM in a bank, then each costs roughly Rs 10. This adds up to Rs 40 per month and a total of Rs 480 will be the cost of servicing these accounts every year. Bankers are aware of these numbers, but the effort is to keep the momentum going. "We organised around 11,500 camps at various places across the country and opened three times the number of accounts we add normally in a day. For the first time, here is a deposit product being attached to insurance and going forward having a pension scheme and small loans scheme attached to it," says B. Sriram, Managing Director, SBI. He and many others see it as a win-win for all and with good reasons: banks get low-cost deposits, banks can also cross-sell other products and services, while insurance companies get access to new account holders. But in all of these, time is the biggest constraint: Modi's goal of achieving this level of financial inclusion - some seven crore households - by January 26 next year is in, some sense, compressing a five-year exercise into less than six months. Most banks have been pooling all their resources and manpower, and this is evident in the large number of new accounts going live nationally. Take Andhra Bank, for instance. The lender straddles Telangana and Andhra Pradesh, regions that were once the hub of microfinance activity. Andhra Bank Chairman and Managing Director C.V.R. Rajendran said the bank set things in motion 48 hours before the launch of the programme. "On August 26, we first had a video conference with all our 33 zonal managers and set a target to add 3,50,000 new accounts by August 28 and we followed this up by setting up over 2,000 account opening camps across the country and ended up opening over five lakh accounts." He says that opening of accounts under financial inclusion has been happening earlier too but the focus now, in a short time, is intense. So, what does all this mean for the poor and financial intermediaries such as banks and microfinance institutions (MFIs)? "Much depends on how banks take this forward. If they do not look at this as a one off-activity and use this as an opportunity to connect with the poor and eventually start offering loans, then the client base of the microfinance institutions could get impacted overtime and the microfinance institutions could see direct competition from banks," says Vijayalakshmi Das, a microfinance expert and CEO of Friends of Women's World Banking. G. Padmaja Reddy, Founder and Managing Director of microfinance firm Spandana Sphoorty Financial, feels the banking infrastructure needs to gear up with better branch network before MFIs in remote locations use these accounts to disburse loans instead of handling cash as they do today. "Banks need to have adequate manpower to service this sudden rise in number of account holders," she says. A new account will hardly lead to financial inclusion if it becomes dormant. Even in case of the accident insurance that is being offered, officials at the National Payment Corporation of India told Business Today that at the time of the accident the account must be active for an account holder to make a claim. In other words, there should be at least one transaction in 45 days prior to the accident. 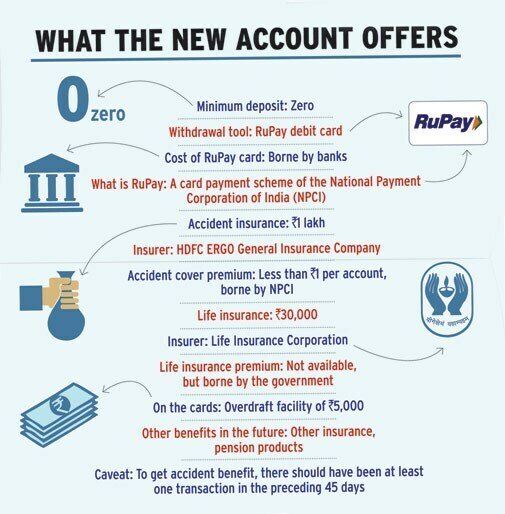 There is hope, however, that with every account holder getting a RuPay debit card with a Rs 1.3 lakh accident and life cover, there will be active users. There is also talk of an overdraft facility for each account holder. As Andhra Bank's Rajendran points out, loans will be offered only after banks monitor the track record of the account holder over the next few months. Plus, there is a promise from Modi that "as we go along, they will be covered by insurance and pension products". Here lies the opportunity for lakhs of new account holders like Goswami in Dharavi and elsewhere across the country to join the banking mainstream. Never mind if the financial community - bankers, insurers et al, along with the tax payers enjoying smooth services so far - sweats it out a bit more than usual.